Since 1959, when Werner and Erika von Trapp purchased the von Trapp Farm, it has been a working dairy. Over the course of three generations, the farm has transitioned to a certified organic dairy and in 2009 added cheese making to the value-added operations. Striving for high-quality standards, the von Trapp Farm produces some of the sweetest organic milk for its premium cheese production. The farm is truly a "farmstead" cheese operation, as the milk from the cows is being produced in an adjacent building to the cheese making facility. The family is committed to making the highest quality cheese with the best milk possible, using traditional methods of small-scale production and continually striving to improve. 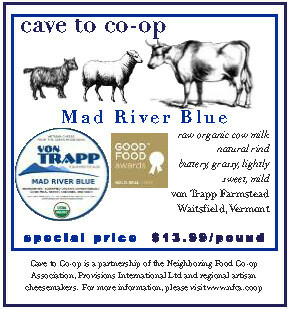 The von Trapps have set out to be part of the solution to Vermont's declining dairy economy and working landscape. Artisan cheese making on a 50-cow family farm is their vehicle to sustainability. Their mission is to be one example of how to make a small family farm in the center of Vermont economically viable by producing delicious organic small batch cheeses. This year, Mad River Blue won a 2015 Good Food Award. These awards celebrate the accomplishments of authentic food producers who combine great flavor with environmental and social responsibility. The cheese is appropriately named for a variety born in the Mad River Valley. This is a natural rinded blue aged for approximately 3 months. It is made with the farm’s certified organic unpasteurized cows milk. This blue is very approachable with a mild blue bite but interestingly complex flavor profile and unique creamy texture. It is wonderful on its own, but also great in these simple recipes that will take the bite out of a chilly spring day. Preheat oven to 375°. Cut a horizontal pocket into the side of each pork chop. Cover each chuck of cheese with chopped hazelnuts. Push 1 cheese chunk into each pork chop pocket. Heat oil in a 12-in. cast-iron or other ovenproof frying pan over high heat. Sear chops until browned, 2 minutes per side. Add pears and thyme to pan. Bake until pork is firm but still slightly pink in the center, about 8 minutes. Sprinkle with reserved nuts. In a large skillet over medium heat, add olive oil. When hot, add minced garlic and cook for a minute. Pour in tomatoes. Add sugar, salt, pepper, and crushed red pepper to taste. Cook for 10 to 15 minutes, stirring occasionally. While sauce is thickening, cook pasta according to package directions and drain. Reduce heat under sauce to low. Stir in crumbled blue cheese. Add cream and stir. Cook for a minute or two, tasting and adding more seasonings as needed. When you are ready to serve, toss in spinach and the cooked and drained pasta. Serve immediately! Split your rolls and put them in to toast. Place frisée in a medium bowl. Cut bacon crosswise into 1/4-inch wide lardons. In a small heavy skillet, cook bacon over moderate heat, until pieces are crisp. With a slotted spoon, transfer bacon to paper towels, reserving bacon fat in pan. Add shallot to bacon fat and cook for one minute, stirring. Add red wine vinegar and let hiss and bubble for 20 to 30 seconds, then remove from heat and whisk in Dijon. Immediately pour hot dressing over frisée and toss with drained lardons, salt and pepper. Remove rolls from toaster and divide bacon-frisee salad between each bottom bun. Top each salad pile with half of the blue cheese. Reheat skillet over medium-high heat. Add the butter and swirl it to coat the pan. Crack one egg into the skillet, season with salt and pepper and reduce heat to medium. Cook to your liking. Remove the egg from the pan and place it on top of the bacon-frisée salad on the bun. Repeat with remaining egg. Preheat the oven to 325°. Butter a 10-inch springform pan. In a food processor, pulse the walnuts with 1/4 cup of the sugar until finely ground. Add the butter; pulse until the mixture resembles moist sand. Press the crumbs into the bottom of the pan. Bake for 12 minutes, or until browned around the edges. Set aside while you make the filling. In large bowl, beat cream cheese until smooth. Add blue cheese; beat until creamy. Add sugar then eggs, one at a time, beating after each addition. Scrape bowl. Add sour cream, honey, salt and vanilla. Beat until combined then pour into cooled crust. Bake for about 1 hour or until center is set. Remove pan from oven and cool completely. Cake may rest in the refrigerator overnight. When ready to serve, remove cake from pan and cut with a very sharp knife.